Nobody likes needles. 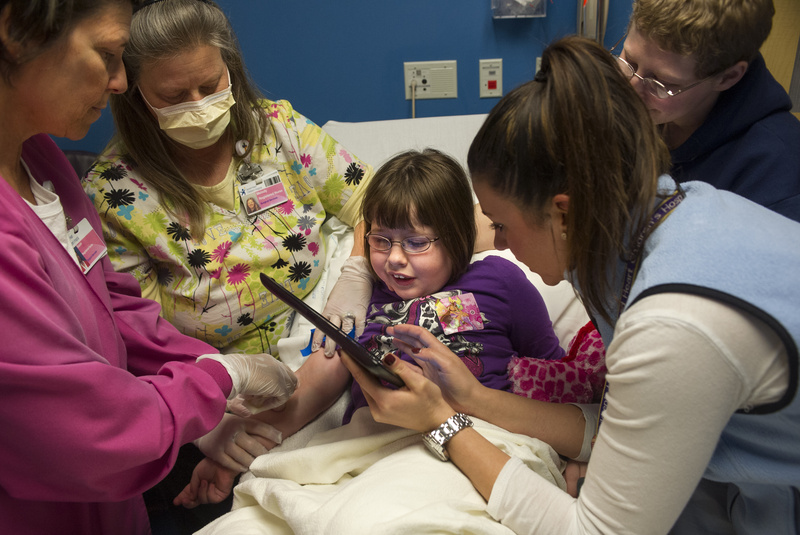 When Robbin Stroud, 8, was so agitated about getting an IV before surgery last week, she needed a sedative. “I hate procedures. I don’t want it in me at all,” she said, her eyes wide while she clutched a stuffed toy named Jungle Love. It’s a common complaint from pediatric patients and their parents, said Keith Georgeson, medical director and division chief of children’s services at Providence Sacred Heart Children’s Hospital. To help address this, last fall he created a pain team to help reduce pain and anxiety for their pediatric patients. They’re in the process of rolling out several new protocols, starting in the surgery center with phased implementation to the emergency room and other pediatric units. Introduced in October, the J-Tip is a needle-free injector that uses compressed air to propel lidocaine beneath the skin’s surface, effectively numbing the area in seconds. In December, when Kaveh Abghari, 11, went in for the second of three surgeries, the device eliminated his IV pain, said his mom, Christine Abghari. About a year earlier, before surgery to remove part of a growing birthmark, hospital staff applied a numbing cream and waited for it to penetrate before inserting an IV. But Kaveh, who was 9, could still feel the IV needle. “He cried. He got emotional about it. He got pretty worked up,” Abghari recalled, adding that surgery and recovery went well so her son’s only anxiety approaching the second surgery was getting another IV. “He was never worried about stitches or surgery, just the IV,” she said. Then the nurse showed him the J-Tip and promised this IV would be easier. “It sounded like a pop can opening,” said Abghari, describing how Kaveh’s arm painlessly numbed within moments. While Kaveh looked away, the nurse inserted the IV. When she said it was over, he was surprised because he hadn’t felt it, said his mom. In fact, he announced that he’d only come for the next surgery if he gets to use a J-Tip again. The device is now available throughout the Children’s Hospital. “The J-Tip program has been so successful the adult floors are wanting it now,” Georgeson said. Funded with a grant from the Providence Health Care Foundation, the Children’s Hospital purchased four mobile nitrous oxide machines, about $6,000 each, to help reduce anxiety during some procedures. Currently available in the surgery center and radiology, after staff training the machines will eventually be available in the other pediatric units. “We’re still in training. We don’t want to do anything that people don’t know well,” said Georgeson, noting they’ll be rolled out to the emergency room next, then the hospital floors. Nitrous oxide, also known as laughing gas, helps calm children during procedures such as IVs, spinal taps, abscess draining and catheters. David Burns, director of pediatric sedation services at Children’s Hospital, said a bladder catheterization isn’t a painful procedure but can be traumatic, making it a good place to use nitrous oxide, which wears off moments after the mask is removed; children often don’t remember the procedure. Also funded by a foundation grant, this year the Children’s Hospital purchased two video goggles, at about $30,000 each, Burns said. Often children are sedated or under general anesthesia for MRIs, he said, because movement may make the image blurry. Wearing the goggles, a child can watch a movie or cartoons during the MRI, which can take 45 to 90 minutes. Burns said the hospital has used a nerve block injection during surgery to keep a localized area numb for about a day post-operatively. About a month ago, Burns said the hospital added a catheter option where a patient can keep an area numb for several days after surgery, blocking the nerve-to-brain pain signals without the side effects of narcotics, such as itching, nausea, sleepiness or mental fog. Although it isn’t new, Georgeson said another method to minimize post-operative pain is using tiny instruments, since most surgical pain comes from access wounds. “It’s well known the smaller the stick, the less pain,” Georgeson said. Termed minimally invasive surgery, using smaller instruments has helped speed recovery times while reducing post-operative pain, Georgeson said. Recovery from appendectomy now can take days, rather than weeks. Other pain- and anxiety-reducing tools and techniques include numbing lollipops for the throat and child life specialists who are trained in distraction techniques. The goal, said hospital staff, is to make the hospital experience less traumatic for children, which they expect also helps kids heal.